You may point to the rivals and say, well, they had better quarters from a growth standpoint, but it’s important to remember it’s easier to grow from a small number to a bigger small number than it is to grow from a big number. In that sense, AWS could be seen simply as a victim of its own success. 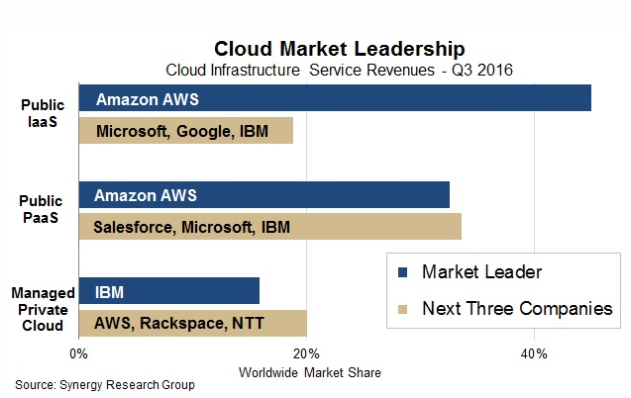 Regardless, even as Microsoft, IBM, Google and Oracle (and even Alibaba) continue to boast big cloud growth numbers, they aren’t getting much closer in terms of market share. It may seem paradoxical until you consider that, even as these companies continue gaining revenue, the market itself is growing at an astounding rate right now. That means they aren’t fighting over a fixed pie — not by a long shot. While everybody throws around market predictions, and it’s hard to know how accurate they are, as a point of reference, consider that IDC predicted a public cloud market value of $95 billion for last year. They expect that market to more than double in just three years, to $195 billion by 2020. If they are even close to right, all of these companies have an enormous potential market to work with. And when you consider that IDC’s projected overall IT budget forecast stands at $2.7 trillion by 2020, you can see that the cloud currently constitutes a minuscule percentage of the overall IT budget spend over the next several years. Forrester is even more optimistic on overall market size, predicting a public cloud market of $236 billion by 2020. Whatever the number turns out to be, it’s fair to say the market is growing rapidly. That’s good news for these vendors as they fight over market share, but it doesn’t necessarily mean that they will be able to catch AWS anytime soon. Amazon was the first to market more than a decade ago with the notion of public cloud Infrastructure as a Service, and nobody even started to challenge them for several years after that. Today, according to data from Synergy Research (keeping in mind it’s a rapidly changing market), AWS has an enormous market share lead, one that John Dinsdale, chief analyst at Synergy Research, says is so big now, it’s going to be very difficult for anyone, even Microsoft to catch them. “Just from a pure math perspective, AWS is so far ahead of the rest that no-one can seriously challenge its leadership in the short term,” Dinsdale told TechCrunch. Yet even beyond the market share lead in itself, AWS isn’t just sitting still resting on its considerable market share lead. It’s continuing to innovate at a rapid rate. “AWS continues to make huge investments in infrastructure, continues to expand its range of services, continues to execute well, is growing its business with enterprises, and has the full long-term backing of Amazon for whom AWS is very important. The combination of math and business logic says that AWS cannot be matched from a scale and market share perspective any time soon,” Dinsdale said. So continue to expect eye-popping numbers from all the public cloud vendors, but just don’t interpret that to mean it’s coming at the expense of AWS. For the most part, AWS continues to grow its market share and add new functionality and services at such a rapid rate that even companies as well-heeled and well-positioned as Microsoft and Google will be hard-pressed to make a significant dent in that market share lead for some time to come.